I struggled to think of something for this. Last year I recreated my mother's famous Tuna Glug, which is normally what we think of when we think of silly food from the past. But I'd already done that! There was my dad's infamous lemonade fish curry, which I don't actually remember. But I am not a fan of faux fishy things or lemonade (this is like Sprite, for my US friends), so I wasn't in the mood for that. But then I was watching someone eating an apple and cheese sandwich, which reminded me of something we used to get when I was little. There is a US diner-style chain called Johnny Rockets, that still exists in the US. For a few years, it also randomly existed in my local suburban Brisbane shopping center. It was very not vegan (but then, neither was I at that point... I believe there may be a vegan option in the US ones now). We used to love going there for burgers, cheesy fries and shakes. And every hour, on the hour, the staff would do some cheesy jukebox dance number. Oh, I bet they hated it. But it delighted my young self! One of the things they had there was apple pie served with cheddar cheese. Apple and cheese is a pretty standard combination, but something about the apple pie with cheddar seemed so strange and daring and silly to my young self. I wonder what my young self would think of the combinations I eat now (bring me your silliest sounding drinks and I will drink them!). So I figured that youthful perception, combined with the fun and slightly silly atmosphere of the diner itself, qualified this as a silly food memory. Yes? Yes. So I wanted to attempt to recreate something similar, but with minimal effort. Making pastry did not fit my minimal effort vibes, and I also didn't feel like buying a huge pack of 12 puff pastry sheets for the sake of half a sheet... in theory I am trying to use up stuff in the freezer. Buying empty vegan tart shells here is not a thing. Do you know what is a thing? Jaffles! Jaffles are fun! Making a pie jaffle is fun! Ideally when making a pie jaffle you would use puff pastry, but see above. So I used some wholemeal bread that I buttered and sprinkled with cinnamon sugar, so that it would get a nice sweet cinnamon crust in my jaffle maker. I used some tinned pie apples, and some FYH cheddar shreds. And I put it all in my jaffle maker until it was golden and hot and melty. 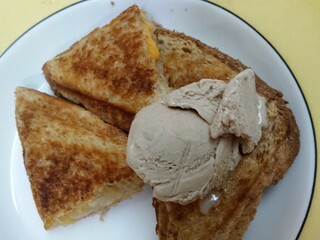 Then I served it with a scoop of So Delicious Cashew Snickerdoodle Ice Cream that I bought on sale on the weekend. The end result was a great afternoon snack. I probably should have added some sugar to the pie apple filling, because it really wasn't that sweet (which was kind of OK by me, but not exactly very apple pie-like). 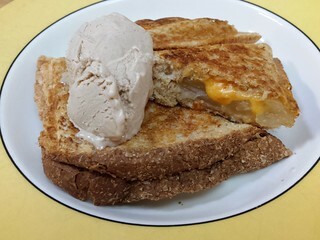 However, as the ice cream melted, it shared its sugary cinnamony blessing and it all mingled into a glorious apple pie with melty cheddar that is actually a jaffle made with bread experience! Maybe a bit of a stretch for being silly, but definitely very fun! What is your favourite pie or jaffle filling? Dim Sim! My very first only mine kitty. 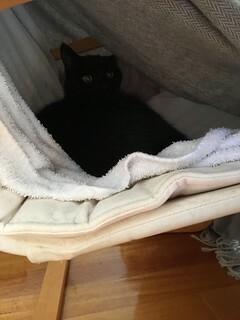 These days she is approaching 17, and has taken to spending a lot of time napping in her chair cave. I have never been to a Johnny Rockets even though there were a few in Seattle. I've also never heard of a jaffle. I have always been terrified of the apple pie/cheese combo. Much like pineapple on pizza, some things just don't make sense!! Dim Sim is so pretty! She has her own little tent, so cute! This looks pretty tasty! I first heard of Jaffles watching Masterchef Australia. I think they are very similar to our British Toasties. I've honestly never had cheese and apple pie but this looks like an easy way to give it a go! Australian jaffles and UK toasties are the same thing. I think that the term jaffle might be trademarked to someone though, because you can't be a 'jaffle maker' here anymore, they are all snack makers. But we all call them jaffles. A toastie here is more like a toasted sandwich in a sandwich press. The ice cream definitely pulled the whole thing together. This is the first prompt (and sadly, maybe not the last) I didn't participate in this year. I had an idea last minute for a silly food tradition, but I would have needed more time, and a Smurf, to make it. Ummmm... you have to make that now, even if it is not for MoFo. I must know how this smurf fits in! Yeah, we don't have the nice traditional lemonade that you have. Here lemonade is clear and bubbly and sweet, like Sprite. My dad used to make croque-monsieurs and pretend he put my precious smurfs in them! I love a toastie but Jaffle is a far better word. In England it's also popular to eat cheese with fruit cake. That seems like it would work well. Fruit cake is often so rich, some nice salty cheese would be a good contrast.